Photo credit for banner image: Copyright © 2002-2012 Fantom-XP & Free Wallpapers inc. All rights reserved. Ballroom Sofa, purcased from "The Time Machine" hobby supply store. Designer unknown. The first two sofas were both found online as I was searching for interesting pieces. Bespaq is definitely one of my favorite brands for handcrafted furniture. I have found their level of detail, especially when it comes to intricate carvings and decorative details, to be unmatched. I pulled the third sofa out of my own collection. 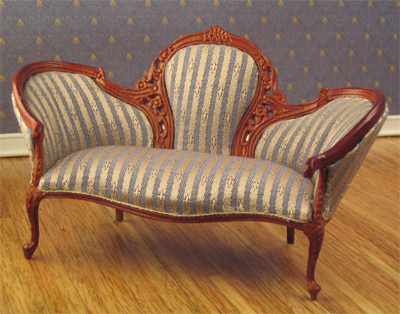 I had purchased shortly before I began designing my castle, intending to use it as a parlor sofa for a Victorian Mansion. However, I loved the shape and the sheen of its upholstery so much that I decided it was better suited for the ballroom in my castle. 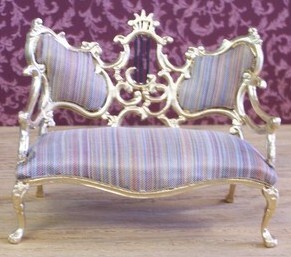 When I purchased the sofa it had a mahogany finish, but I painted the wood gold to give it a gilt appearance. I also added a few more "carved" details to make the golden frame look more intricate, using an idea I had seen in one of my magazines. I took an oak leaf-shaped hole punch and punched a bunch of shapes from a manilla file folder. I painted them gold to match the sofa's frame, arranged them to form a pleasing design and attached them to the frame of the sofa. Once the decorative carvings had been added, I glued the gold cording that you see around the cushions to add an extra point of visual interest. Since my ballroom is Cinderella-themed, I love the idea of it dripping with crystals when it's finished, so I added a few crystals to finish off the sofa. Working off of the colors from these three pieces, I chose the colors for the Ballroom, Library, and Thumbelina's Parlor. Once I had a general idea, I went searching for wall coverings that would bring the colors to life with a little added magic. One of the most important lessons I have taken from this project thus far, has been how significant evolution can be to the creative process. I typically attack my craft projects with an "instant gratification" approach, coming up with the idea, and then powering through to the end when it's sparkly and finished and beautiful. I don't like having to wait to play with my new prize. While this has served me well for school projects and costumes that I'll be wearing at a party the next day, it can sometimes lead to a more make-shift feel to my craftsmanship than what I am now trying to attain. I guess I just get so excited about my ideas that I want them there in front of me, finished and ready to go, so the in-between process, before the project is perfect and finished, can become tedious. My castle has been a very different experience, however. Given that I was so young when I started designing my castle, it took a number of years before I could begin building. I first had to firm up my plans enough to convince my dad to help me start building. I also had to gather the economic resources to be able to afford the wood and building supplies, and given that I started designing years before I had my first job, that in and of itself was a long process. Because of these factors, I had a five-year pre-production period during which I was devoting my focus to my design plans, giving them plenty of time to evolve. I mentioned briefly in my first entry some of the ways in which my castle has changed, with the further addition of more and more rooms. However, expansion has not been the only change brought about by my design process. The plans that I made for the initial rooms and overall layout of the castle have also, necessarily changed. They have changed as I've done more background research on castles, both big and small, and their shapes and placements have also changed to fit the new additions. They've also changed as I've become exposed to new crafting techniques. Below are some examples of how the ballroom has changed through some of the various sketches I've drawn. I choose the ballroom because it was the first room I drew the night I started thinking about this project. It is also the room that I am currently constructing. Although some of the changes have been small, they have all been important to the overall feel of the room, and none of them would have come about if the project hadn't been afforded such a generous gestation period. The long design period has also given me the time to really get to know the project. The most detailed blueprints that I have at this point are in my head. It's also helped me to put aside some of the fear of changing things around. Just because I have a solid way to resolve a design issue, doesn't mean it's the only way it has to be done if there still seems to be something missing. This project would be very different if not for the evolutionary nature to its creation, and it is a process that continues even as I have entered into the construction phase. I guess it all started with an issue of a "Dollhouse Miniatures" magazine that showcased Colleen Moore's fairy castle. I mean, I have loved fairy tales all my life, of course, but it was that magazine that got me dreaming not only of a prince and a love story, but of magical places brought down to miniature scales. It was before I had even finished my first dollhouse, on a family trip up to New Hampshire. We were staying in a little motel room, my two sisters, brother, father and I, and the only reading material I had with me was the magazine issue and my favorite childhood book of fairy tales. It was Colleen Moore's castle that inspired me to build, and my fairy tale book that gave me the theme. What I loved most about this particular book of fairy tales was all of the beautiful artwork. Each story was illustrated with beautiful pictures filled with exquisite detail and vibrant colors. I decided that for my castle, each room would be based on a different fairy tale from my book. I would scan the illustrations and shrink them down to fit into miniature picture frames, so there would be paintings going around the walls of each room, telling the story on which the room was based. That night, I never would have guessed how expansive this project would become. What began with three rooms: a ballroom, a princess bedroom and a dining room, now includes over twenty rooms, as well as an elaborate outdoor courtyard. The ideas for rooms come from movies, books, magazines, pictures; while I'm awake, asleep, working, playing, doesn't matter--I find ideas come from many sources and in many places. I've spent the nine years since learning how to bring it to life. This blog is meant to chronicle the creation and (hopeful) eventual completion of the most rigorous crafting endeavor of my life: my dollhouse castle. When it is finished it will approximate the size of a large mini-van, will include over twenty rooms filled with everything from fairy tale artifacts to crystal chandeliers, and will showcase all of my most painful lessons in crafting--I may even learn how to sauder! I had no idea what I was doing when I got into this and a lot of the time I still don't, but this castle, as much as it has been a journey of frustration, is also a true test of my loyalty, love, and belief in my creative self. I'm a twenty-something woman who is learning how to be a responsible grown-up, while still recognizing how important it is to save time for play.